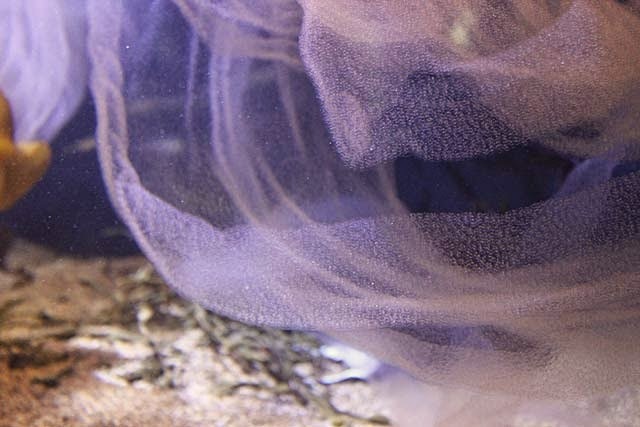 Sharing images of the goosefish's egg veil is something we look forward to all year. And it's that time again. 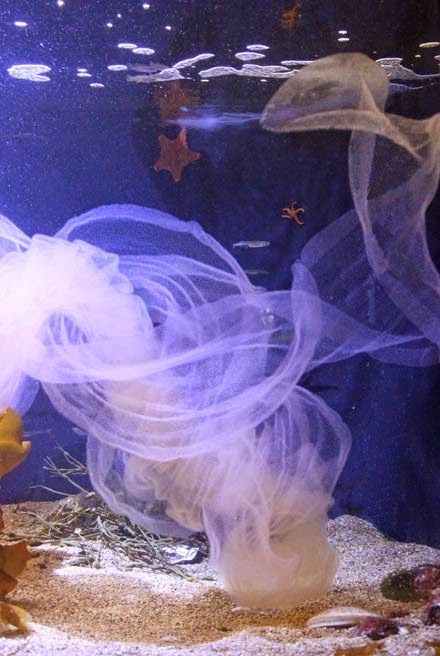 The goosefish's care team arrived Monday morning to find she had laid another veil, as graceful, billowy and ephemeral as ever. I thought that was a length of fabric! Right? The name "egg veil" is very descriptive. There are about a million eggs in this sheet. It's only a single egg thick, about a foot wide and nearly 60-feet long. How did it get tangled up? The sheets billows and drifts about the exhibit, as it would in the open ocean. What will they do with all those babies? The eggs are not fertilized since there is not a male goosefish in the exhibit. The aquarists leave the sheet in the exhibits for a couple days only. It's removed when before it starts breaking apart. It looks like a jellyfish, I wonder what it feels like. It actually feels like a sea jelly. It's slippery and gelatinous and stronger than you might think! 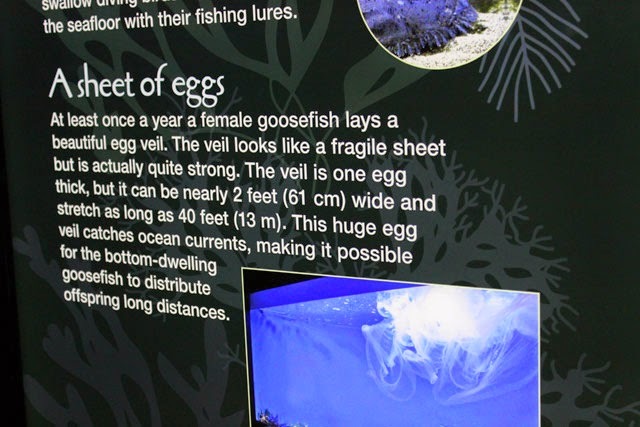 Here's a look at the egg veil in the exhibit. 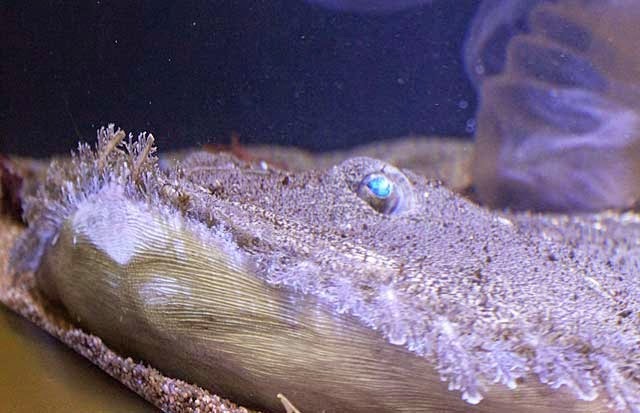 Aquarist Bill Murphy had his video camera to catch the goosefish laying the egg veil last May. Her egg veil even made it into the National Geographic magazine last year! able to see one in person once or twice a year. 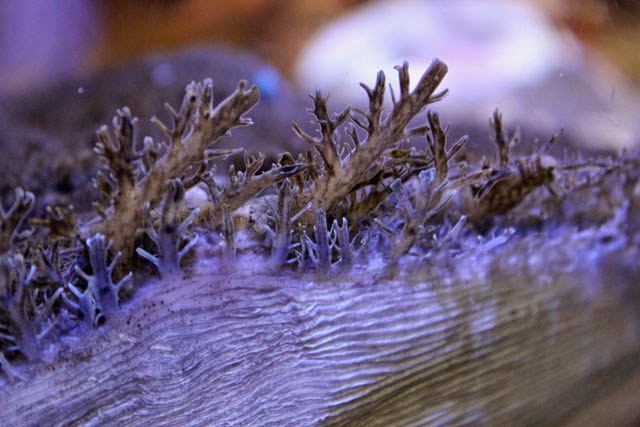 help goosefish camouflage in the sandy bottom. One of the goosefish's neighbor is the octopus. Learn about octopus egg laying in this post. On the sunny end of the Northern Waters Gallery you'll find the shorebirds, with new additions! There's a certain, beloved Disney movie that almost always comes up during a visit to the Aquarium. In particular, there's a lot of finding in the Tropical Gallery on the first floor. You know what we're talking about. Yup, Finding Nemo! 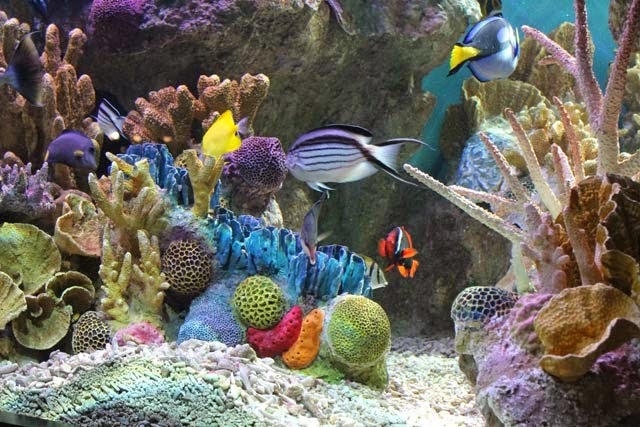 And you can see three species from the movie in the vibrant Pacific Reef Community. 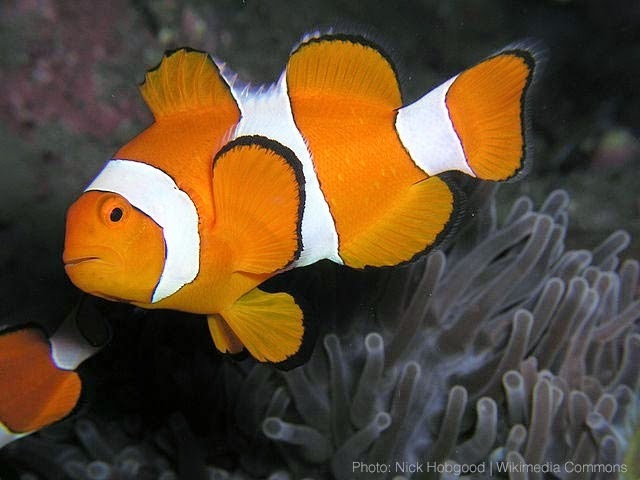 First up, the distinctive stripes and bright orange color of the clownfish! There are a couple species of clownfish in this exhibit, but it's the Ocellaris clownfish (Amphiprion ocellaris) that folks will recognize as Nemo. These are smaller fish that will grow to be only a couple inches long, at the most. And it's obvious that these little guys are on the smaller end of the spectrum in this exhibit. Look closely! 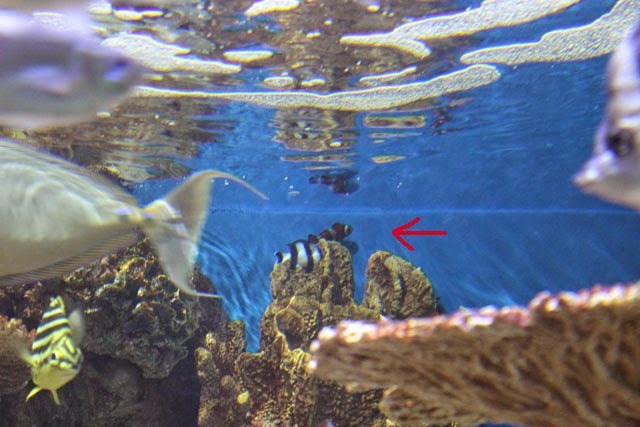 The clownfish usually hide out along the back of the exhibit toward the right. While clownfish in the wild (and the living coral exhibit) usually make a home in an anemone, this pair has carved out a small territory where they feel safe. Look for them at the far right side of the exhibit, along the back wall (see picture). 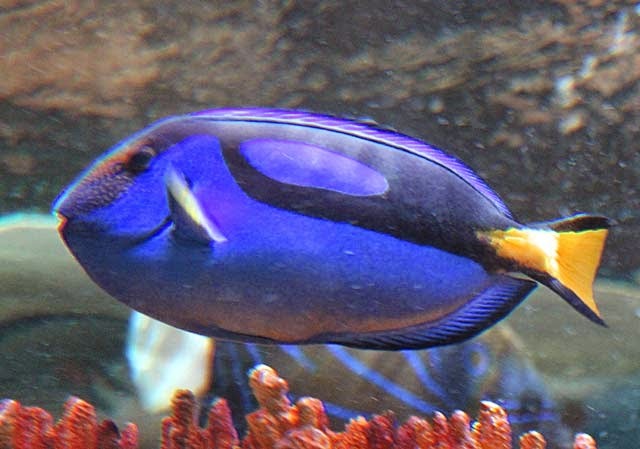 Next, Nemo's dad's good buddy Dory—the palette surgeonfish (Paracanthurus hepatus). There are around eight of these royal blue beauties in the exhibit. They can grow to be about a foot long with a thin, pancake-like body shape. The name surgeonfish comes from the sharp scalpel-like spine at the base of their bright yellow tail. It's a defense mechanism. They can turn-tail and slice at threats, inflicting a deep wound with their sharp caudal spine. 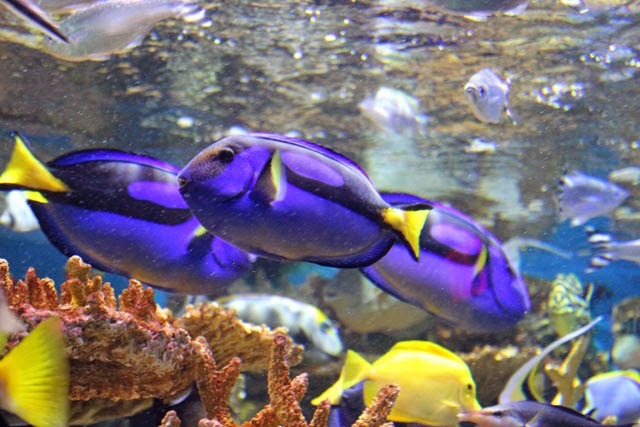 Look for the palette surgeonfish cruising quickly back and forth across the exhibit, nibbling algae from the fiberglass corals or snacking on plankton in the water. 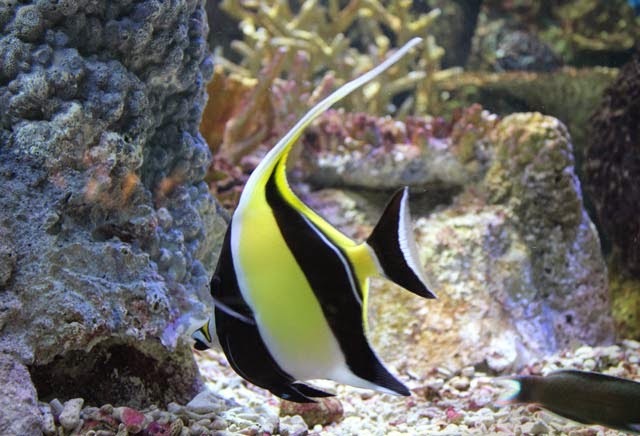 Last from the cast of Finding Nemo in the Pacific Reef Community, look for the one Moorish idol (Zanclus cornutus) cruising the reef. (Not to be confused with the pennant bannerfish, more on that black and white striped fish later.) 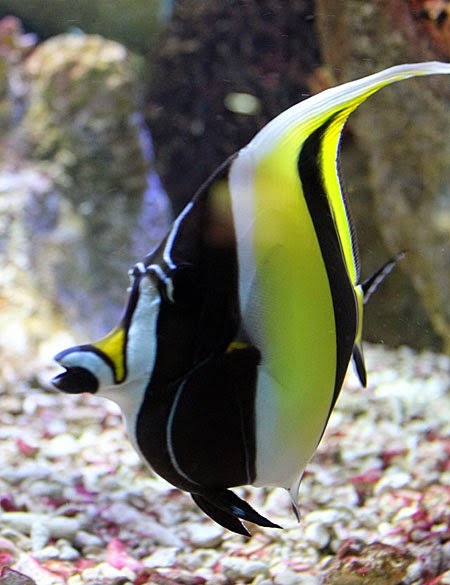 This handsome fish of black, white and yellow has a distinct long, flowing dorsal fin and a puckered mouth. There's a full spectrum of colors, patterns and behaviors streaming through the Pacific Reef Community on the first level of the New England Aquarium. Transport yourself to far-away reefs, where you can appreciate how life inspires art.